Donald Trump's beef with Megyn Kelly is back on -- with a vengeance. On Saturday he said Kelly "should not be allowed" to moderate the next GOP debate. But Kelly is definitely moderating it -- and her employer, Fox News, is dismissing his complaint. From Fox's perspective, this is just predictable bluster from Trump. A Fox News spokesperson responded with a statement that began: "Megyn Kelly has no conflict of interest." "Donald Trump is just trying to build up the audience for Thursday's debate, for which we thank him," Fox said. Kelly, Bret Baier and Chris Wallace are set to be the three moderators of next Thursday's GOP debate in Iowa. Trump famously tangled with Kelly during the first debate of the primary season last August. Kelly's first question to him recounted how he'd disparaged women with terms like "fat pigs, dogs, slobs, and disgusting animals." She also invoked the "war on women" and asked about his temperament. Trump tried to deflect the dart, but it stuck, as did other questions from the moderators. Afterward, Trump said "I thought Megyn behaved very badly, personally," and criticized her repeatedly. In an interview with CNN's Don Lemon, he said "You could see there was blood coming out of her eyes. Blood coming out of her... wherever." Trump eventually toned down his comments about Kelly, but he has criticized her off and on ever since. "Based on @MegynKelly's conflict of interest and bias she should not be allowed to be a moderator of the next debate," he tweeted on Saturday. 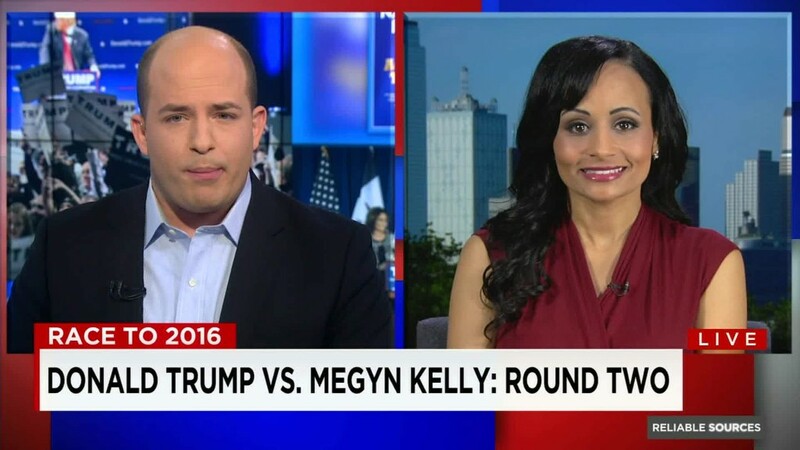 Interviewed on CNN's "Reliable Sources" on Sunday, Trump spokeswoman Katrina Pierson played down Thursday's debate. "There's no love lost between Megyn Kelly and Donald Trump after that first debate. But I think it's going to be fine," Pierson said. "We're at a point where you either like Trump or you don't like Trump. I don't think this debate is going to make that determination just because Megyn Kelly's on the panel."